I am really sick of talking about tribal decks. I want to talk about something that isn’t tribal and I’ve been doing that on Gathering Magic where I can. Since they decided to integrate Commander 2017 with Ixalan (which is neat, don’t get me wrong) they have mostly tribal commanders in Ixalan as well as the tribal commanders in Commander 2017. Most decks being built now are tribal. I want to talk about Marvin Feins or whoever and I’d like to talk about Tishana (as boring to build as I imagine Tishana is going to be) and it doesn’t matter because I have to talk about where I think the money is. I can’t ignore data because that’s irresponsible. So as much as I would like it if Tishana were likely to matter, I’ll save that for my Gathering Magic article next week (which you should absolutely read, by the way. If you find this article valuable, that is. It’s free to read, they can justify paying me if people read it and I talk about EDH cards which it turns out I’ve established are relevant) and focus on a deck I don’t even want to talk about a little bit but which was built 3x as much as Tishana. I don’t pretend to understand EDH better than basically everyone who plays Magic and I’m certainly not inclined to pontificate that I can figure it out faster than that group of people known as “everyone.” I was worried that I would miss the boat entirely by waiting to get build data from EDHREC on the Commander 2017 commanders. It turns out everything worked like normal this time – we had a wave of people buying specs as soon as they knew the decks were tribal and most of those specs were bad. We had another wave of people buying when they knew what the tribes were, and most of those specs were bad. The prices on those cards are likely ruined forever, but organic demand didn’t drive them and you’re likely going to get stuck with your copies unless you bought a very small amount, in which case you didn’t really speculate. If you predict a card going from $2 to $20 and you bought 10 copies, you weren’t confident or ballsy and you didn’t get rewarded. If you predict 10 cards going from $2 to $20 and you bought 0 copies, you’re me, but that’s another story. The third wave after the first two “Uh, I think I can figure out that a tribal Wizard deck is going to play Patron Wizard, EDH isn’t that tough to figure out, guy” speculators, we had the “normal” wave of cards going up based on people figuring out what people were actually doing. 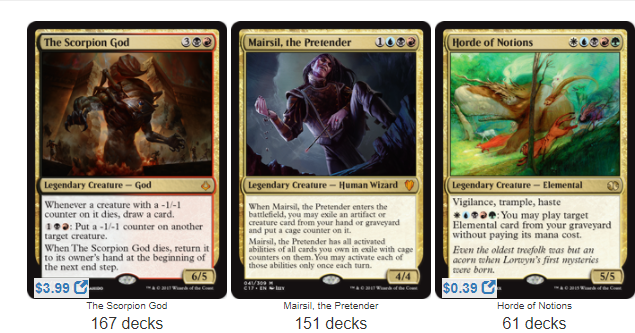 It took me a long time staring at Mairsil to figure out anything I wanted to put a cage counter on but the internet figured it out eventually, I wrote an article about Mairsil stuff like a month after Commander 2017 came out and those cards are popping off, a few a week. It’s 2015 again! So while the tribal decks make people think they knew what they’re doing get super confident, we can still do our normal thing. Hateflayer popped this week, but it had been growing steadily recently and as we predicted, Mairsil gave it a lot of upside. Let’s compare a card like Patron Wizard which is at $20 instead of the $3 Hateflayer is currently selling for. So we have 4 decks that were running it before and 94 new Inalla decks (it’s OK in Inalla, don’t get me wrong) jamming it. Do we think the spike to $20 was justified? Do we think it hangs out there? I’ll leave that for the bro finance crowd who thought it was super obvious to buy every Wizard despite none of the older Wizards really playing all that well with Mairsil or Kess at all. The decks were called tribal but 2/3 of the marquee commanders and like all of the other random commanders like Taigam(s) don’t care about tribes, really and certainly not in the way everyone who bought in the first two waves “knew” it would matter. $20 Patron Wizard is a joke but if you are one of the few people who need it for Inalla, the joke’s on you. The stuff in the Mairsil deck that no one predicted when the card was first announced but going up later when we had pricing data leads me to believe that even though tribal stuff is “obvious” to some who think being able to make simple, superficial observations means that all of this is easy, we’ll still be able to make money by seeing what players are actually playing, buying before supply dries up and selling into the increased demand like always. Tribal decks screwed up a lot but they didn’t screw up everything. I don’t want to talk about dinosaurs but I sort of have to. Gishath isn’t a card that is particularly exciting to me but it’s getting built kind of a lot this week. Anything that gets over the Atraxa hump is worth discussing. I predict I have to dig down a little bit to (I want to let you know that at this point in the sentence I conceived of and immediately abandoned an idea where I’d make a bunch of puns about an archaeological excavation for dinosaur specs and how they are like dinosaur bones. I don’t want you to think I’m the kind of guy who can’t resist a dumb metaphor but I also don’t want you to think I’m not smart enough to figure out there was an opportunity there). 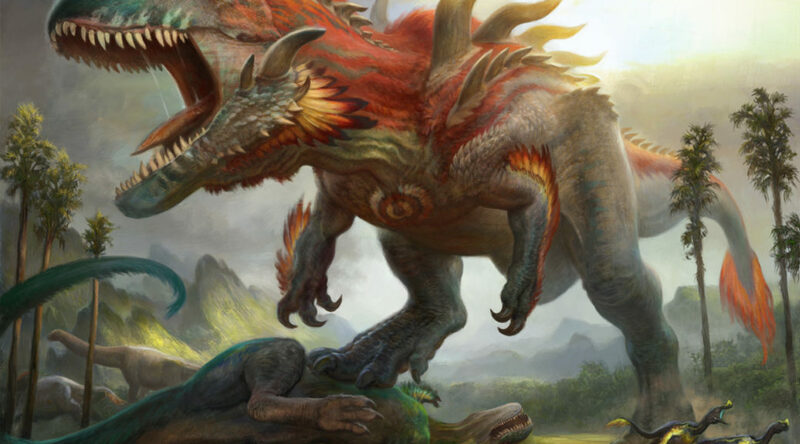 Gishath is made up almost entirely of terrible, bulk rare dinosaurs and uncommons plus the same tribal stuff that is going to go up a little but do you want to be paying $20 for a card that’s going to hit $23? With this many Gishath decks being built, there is going to be money to be made and it’s going to take some work to find it but we’ll do it. An amount of reprint risk that I would classify as “moderate” has a lot of people spooked. Could this be in some duel deck? Maybe Inconic Masters? Basically, people are worried about this going in Commander 2018 and if it’s not, I think this is a real opportunity. This is doing an odd Shepard Tone thing with the price graph but I really think we’re at a tipping point. I don’t like to buy deep into specs that I advocate because I don’t want to be accused (more) of trying to pump and dump cards. It never feels good even when it’s ridiculous. I won’t say who but he knows who he is, accused me of trying to pump and dump Tropical Island because I said it would correct to be more than Bayou since it was less than Bayou at the time. So I guess if being ethical gets you nowhere, I might as well throw a couple hundo at Xenagos and see where it Xena…goes….from there? I probably won’t, but I should. Real talk, there are only 139 listings on TCG Player right now, this goes in every Gishath deck plus it’s nutty in other decks plus it’s a decent commander in its own right. You can find these for like $7 online. Why isn’t this more money? Because the demand is organic and that doesn’t set off any alarms. You’re flirting with some (moderate) reprint risk (reprinting Iroas in a Commander set spooked people) but you’re also looking at some real upside. 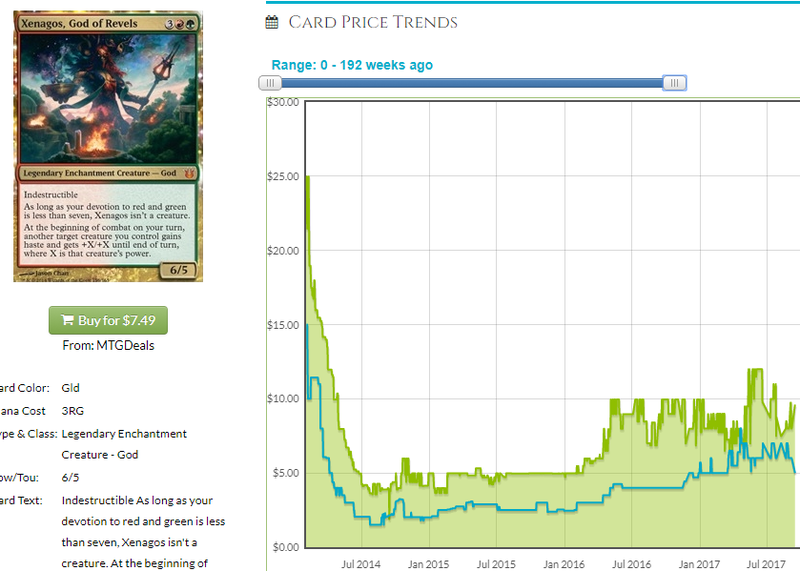 This is the second best Theros era God and it can break the $10 mark easily and from there, they sky’s the limit. This card isn’t Expropriate, but it’s a beating. With Conspiracy 2 being such a wildly unpopular set, it’s tough to get the packs moving. What’s driving sales? Leovold, a card banned in EDH? Packs that contain cards that can only be used in drafts? People drafting it? 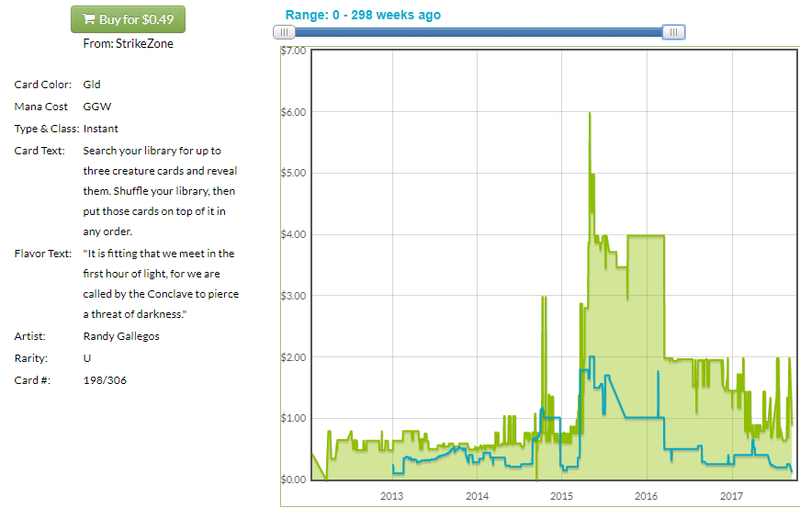 With boxes selling on eBay for basically dealer cost, Conspiracy 2 cards are on the way up. Unless they’re reprinted, something that’s doubtful in the case of a lot of the cards, demand is going to begin soaking supply. Selvala’s Stampede has a lot going for it and it’s particularly good in the Gishath deck. Some Legacy demand would sure be nice but since that’s not going to happen, we’re going to have to rely on scarcity, which is fine because scarcity is giving Conspiracy 2 cards all it’s got. 6 mana is super doable in EDH, it’s especially doable in a dino deck with a high mana curve that requires a ton of ramp and it’s asymmetrical. At $2 this card is pretty bananas, and with Leovold not as in-demand, expect the value from the set to go somewhere if the boxes are to maintain even dealer cost. The second spikes are always the tastiest and while demand petered out after the first brush with greatness, new demand is coming for this card. Gishath is a “the top of your library matters” card and this stacks the deck for you, making sure you hit what you need. Triple Worldly Tutor seems pretty good to me for under a buck and we’ve seen this flirt with $5 absent organic demand. With more copies likely concentrated in the hands of the dealers and unable to mitigate a second spike, this card could climb to around $3-$5 and stay there. It’s a gamble so I think your best bet is to do what I do and buy collections and yank these out of “bulk” all the time. Foils are already $5 and those are even less reprintable and as lazy as that is intellectually, it’s a safer place to park money. 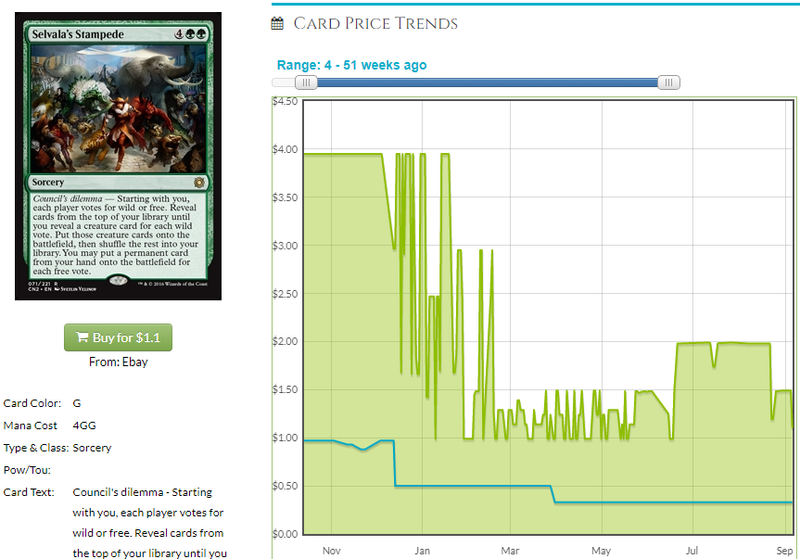 Do I think enough people are going to foil their dinosaur deck that this is going to make more than one person money? Not really. Foils are great for someone to think of it and make some money selling the few copies they’re going to sell on TCG Player but they’re not great calls to give advice to thousands of readers. Maybe you can all fight each other for the few copies left on TCG Player. You can count on reddit to make a “ZOMG BYEOUT!! !1” post when the stock gets low, you can count on a few lunatics to buy a foil card that’s useful in EDH (somewhat) and you can count on me taking credit for nailing another spec weeks early in my oddly prescient article series that no one reads. 1509 total decks is nothing to sneeze at. I thought maybe Dinosaurs might be a better deck than most to try and foil out since a lot of the dinosaurs are dirt cheap even in foil, but then you’re trifling with foil Urza’s Incubator, Mirari’s Wake, Cavern of Souls, etc and you’re stuck with a lot of cards from Commander 2017 that can’t be foil but you really want to be. In general, I don’t think people want foils of bad cards as much as people who sell one or two copies of that card a year claim. Herald’s Horn keeps going up and Path of Ancestry doesn’t. I’m not sure what to make of that. Horn presold for like $2 and is now like $6, Path presold for $3 and is now like $3. Sure, Path is in twice as many precon decks, but you want to know something interesting? It’s twice as popular. I’m not saying those two effects should cancel each other out, and with Horn being buried in the terrible cat deck, supply isn’t quite at a 2:1 ratio in the world. Both cards are good but the price only moving on one of them is a little puzzling. Horn isn’t 3 times as good as Path and Path’s price isn’t commensurate with its popularity. All I know is that both cards are great and the fact that there is pent-up demand for them for tribal decks that aren’t being built from the precon means there will always be net demand. Who’s opening a precon, building a deck out of it and cutting either or both of these? 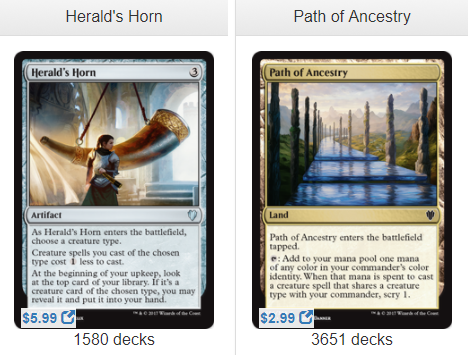 In the case of Horn, you’re maybe building a Mirri or (the cat blacksmith, not interested in taking the time to look up his stupid cat name this close to the end of the article) deck and maybe you don’t need Horn, but I bet you don’t cut Path. These cards are going to be good forever and they’re awkward to reprint unless the Commander set has a tribal theme (even just within the one deck, doesn’t have to be set-wide). Next week I’m not sure what I’ll have to talk about, but hopefully more people build Tishana and it will be interesting. I’d love to force my agenda on this conversation but we really have to go where the money is and this week there were 3 times as many Gishath decks. Next week, a lot could change. Until next time! I like your picks that are similar to Congregation at Dawn. What about something like Worldly Tutor itself, or Mwonvuli Beast Tracker promos? Or Gishath ability analogs, like Collected Company (other reasons for demand) or See the Unwritten? I like a lot of those picks but I am not sure A) How much room is in the deck and B) wouldn’t you rather load up on enablers than cards that do Gishath’s job? I have looked at a lot of lists and don’t see cards like CoCo or S.t.u in them. There might not be room. And yeah, maybe people are wrong, but we need to buy what people are playing and not what we want them to play. I don’t hate Worldly Tutor, though. Scroll Rack and Top are already expensive, as is Mirri’s Guile, but I don’t hate Worldly Tutor and maybe Traverse the Ulvenwald. Also, Garruk, Caller seems to go really well there. That thing has to be super cheap still doesn’t it? I’ve been quietly acquiring foil copies of Traverse. I have a feeling that will pop up in a supplemental product in the very near future dashing a lot of people’s hopes on pack rare spikes. I’m going more toward foils in general of staple cards where available for that very reason. But Traverse seems so good in both Modern and EDH, where we want to be!